The entire history of the American frontier is one of rebellion against the law, if, indeed, that may be called rebellion whose apostles have not yet recognized any authority of the law. The frontier antedated anarchy. It broke no social compact, for it had never made one. Its population asked no protection save that afforded under the stern lordship of the six-shooter. The anarchy of the frontier, if we may call it such, was sometimes little more than self-interest against self-interest. This was the true description of this border conflict. The Lincoln County War, fully speaking, embraced three wars; the Pecos War of the early 1870s, the Horrell War of 1874, and the Lincoln County War proper, which may be said to have begun in 1874 and to have ended in 1879. The actors in these different conflicts were all intermingled. There was no blood feud at the bottom of this fighting. It was the war of self-interest against self-interest, each side supported by numbers of fighting men. At that time Lincoln County, New Mexico, was about as large as the state of Pennsylvania. For judicial purposes, it was annexed to Donna Ana County, and its territories included both the present counties of Eddy and Chaves, and part of what is now Donna Ana County. It extended west practically as far as the Rio Grande, and embraced a tract of mountains and high tableland nearly two hundred miles square. Out of this mountain chain, to the east and southeast, ran two beautiful mountain streams, the Bonito and the Ruidoso, flowing into the Hondo River, which continues on to the flat valley of the Pecos River—once the natural pathway of the Texas cattle herds bound north to Utah and the mountain territories, and hence the natural pathway also for many lawful or lawless citizens from Texas. At the close of the Civil War, Texas was full of unbranded and un-owned cattle. Out of the town of Paris, Texas, which was founded by his father, came one John Chisum—one of the most typical cowmen that ever lived. Bold, fearless, shrewd, unscrupulous, genial, magnetic, he was the man of all others to occupy a kingdom which had heretofore had no ruler. John Chisum drove the first herds up the Pecos Trail to the territorial market. He held at one time perhaps 80,000 head of cattle under his brand of the “Long I” and “jinglebob.” Moreover, he had powers of attorney from a great many cowmen in Texas and lower New Mexico, authorizing him to take up any trail cattle which he found under their respective brands. He carried a tin cylinder, large as a waterspout that contained, some said, more than a thousand of these powers of attorney. At least, it is certain he had papers enough to give him a wide authority. Chisum riders combed every north-bound herd. If they found the cattle of any of his “friends,” they were cut out and turned on the Chisum range. There were many “little fellows,” small cattlemen, nested here and there on the flanks of the Chisum herds. What’s more natural than that they should steal from him, in case they found a market of their own? That was much easier than raising cows their own. Now, there was a market up this winding Bonito Valley, at Lincoln and Fort Stanton, New Mexico. The soldiers of the latter post, and the Indians of the Mescalero Reservation nearby, needed supplies. There were others besides John Chisum who might need a beef contract now and then, and cattle to fill it. 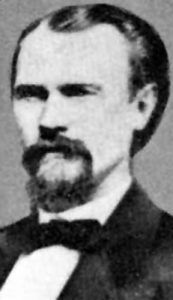 At the end of the Civil War, there was in New Mexico, with what was known as the California Column, which joined the forces of New Mexican Volunteers, an officer known as Major Lawrence G. Murphy. After the war, a great many men settled near the points where they were mustered out in the South and West. 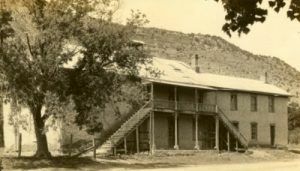 It was thus with Major Murphy who located as post-trader at the little frontier post known as Fort Stanton, which was founded by Captain Frank Stanton in 1854, in the Indian days. John Chisum located his Bosque Grande Ranch about 1865, and Murphy came to Fort Stanton about 1866. In 1875, Chisum dropped down to his South Spring River Ranch, and by that time Murphy had been thrown out of the post-tradership by Major Clendenning, commanding officer, who did not like his methods. He had dropped nine miles down the Bonito River from Fort Stanton, with two young associates, under the firm name of Murphy, Riley & Dolan, sometimes spoken of as L.G. Murphy & Co.
Murphy was a hard-drinking man, yet withal something of a student. He was intelligent, generous, bold and shrewd. He “staked” every little cowman in Lincoln County, including a great many who hung on the flanks of John Chisum’s herds. These men, in turn, were in their ethics bound to support him and his methods. Murphy was king of the Bonito country. Chisum was king of the Pecos; not merchant but cowman, and caring for nothing which had not grass and water on it. Here, then, were two rival kings. Each at times had occasion for a beef contract. The result is obvious to anyone who knows the ways of the remoter West in earlier days. The times were ripe for trouble. Murphy bought stolen beef, and furnished bran instead of flour on his Indian contracts, as the government records show. His henchmen held the Chisum herds as their legitimate prey. Thus we now have our stage set and peopled for the grim drama of a bitter border war. The Pecos War was mostly an indiscriminate killing among cowmen and cattle thieves, and it cost many lives, though it had no beginning and no end. The Texas men, hard riders and cheerful shooters, for the most part, came pushing up the Pecos River and into the Bonito Canyon. 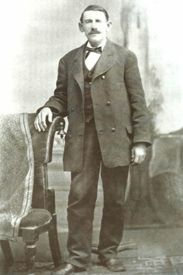 Among these, in 1874, were four brothers known as the Horrell boys, Bill, Jack, Tom, and Bob, who had come from Texas in 1872. Two of them located ranches on the Ruidoso, being “staked” therein by Major Murphy, king for that part of the countryside. The Horrell boys once undertook to run the town of Lincoln, and a foolish justice ordered a constable to arrest them. One Jack Gylam, an ex-sheriff, told the boys to put on their guns. On that night there were killed Gylam, Bill Horrell, Dave Warner and Martinez, the Mexican constable. The dead body of Martinez was lying in the street the next morning with a deep cross cut on the forehead. From that time on for the next five years, it was no uncommon thing to see dead men lying in the streets of Lincoln. The Horrell boys had sworn revenge. There was a little dance in an adobe one night at Lincoln when Ben Horrell and some Texas men from the Seven Rivers country rode up. They killed four men and one woman that night before they started back to Seven Rivers. From that time on, it was Texas against the law, such as the latter was. No resident places the number of the victims of the Horrell War at less than forty or fifty, and it is believed that at least seventy-five would be more correct. These killings proved the weakness of the law, for none of the Horrell gang was ever punished. As for the Lincoln County War proper, the magazine was now handsomely laid. Only the spark was needed. What would that naturally be? Either an actual law court or else—a woman! In due time, both were forthcoming.